A 3D model created by Autodesk will be used during restoration of the Eiffel Tower grand site — all 2.4 square kilometers of it. 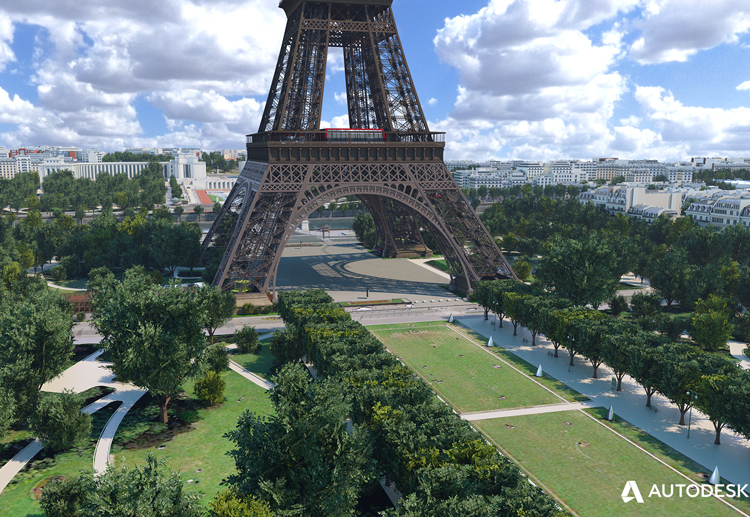 The model will be used by the Paris Council to engage with the public during the design and construction process, allowing Parisians and tourists to experience the Eiffel Tower like they never have before — in virtual 3D. Autodesk is the sole technology provider collaborating with the City of Paris on this prestigious and unique project and used Building Information Modelling (BIM) to create the largest urban model of its kind worldwide, complete with buildings, roads and infrastructures, pedestrian zones and crossing, urban furniture and green areas. The sheer scale of the project has been an exciting challenge for the Autodesk team tasked with creating the data-set of the 3D model. Mapping the details of the 2.4 square km site required LiDAR scanning to generate 194 point cloud tiles, aerial photography that is precise to the nearest 2 to 5 cm depending on areas, and creation of 342 GB worth of point cloud data (10.3 billion points), all of which can be used to create models in both Autodesk InfraWorks and 3ds Max. Over the next year, Autodesk will work with the teams to visualize their designs for the Eiffel Tower grand site, giving them access to a simplified version of the 3D model to use during the different stages of the competition process. The model will help illustrate visibility of project design components from various lines-of-sight and viewpoints, helping the teams to create individual proposals for the future urban space. Additionally, the model will be used by a jury panel during the final judging of the four proposals to better understand them. The four designs will be unveiled in Spring 2019, and the construction of the winning project will start in 2021. The renovation of the Eiffel Tower area, covering the Trocadéro Gardens and the Champ de Mars, will be finalized just in time for the 2024 Summer Olympics, and ahead of other major events including the 2025 Universal Exhibition and the 2026 Rugby World Cup. While the makeover will make the area more pleasant for visitors, the project isn’t just a cosmetic effort. The Parisian metropolis needs to address growing challenges relating to energy, greening, supply networks, mobility, logistics, waste management and security of the area. Not only that, but with Paris renowned for flooding and climate scientists expecting this to increase, the city is taking necessary pre-emptive measures to prevent future damage. While this project may be taking place in Paris, Autodesk hopes its impact will be felt worldwide. Growing populations, diminishing resources, skills gaps, and squeezed business margins are just some of the pressures being felt by construction firms all over the world. At the same time, they’re challenged with delivering projects on time, with less waste and that are more cost effective with less carbon footprint. But the BIM process, as well as other digital tools and cloud-enabled technologies, hold the answer. They can help architects, engineers and contractors visualize designs before they’re built, leading to more efficient and accurate projects. They also enable closer collaboration amongst teams since designs can be accessed from anywhere, at any time. The Eiffel Tower project is one of the most prestigious uses of BIM around the world on this type of urban project, and a great example of how a city – and indeed, a government – can harness new digital technologies to accelerate automation in the construction industry. For more information on this project, visit https://www.paris.fr/actualites/un-appel-a-projets-pour-reamenager-la-tour-eiffel-5397.